The ‘Escuela de los Commons’/’School of the Commons’ is a horizontal platform for the production, exchange and dissemination of knowledge resulting from communal management of tangible resources (woods, earth, squares, gardens) and intangible ones (software, knowledge, information). The Commons – those processes and resources that don’t operate under the logic of mercantile/private property nor under state hierarchy – are nowadays an object of study and experimentation by many organisations, social collectives and local communities. Today it is a priority to share and optimise those expressions of knowledge produced and managed by the social body. We think that the commons contain many of the keys to move towards a social model that is sustainable and based in the principles of social justice. The ‘Escuela de los commons’ has as its principal objective to practice hybrid models of learning. It aims to be a social school where P2P – peer production – methodologies are melted with more traditional formats of learning. 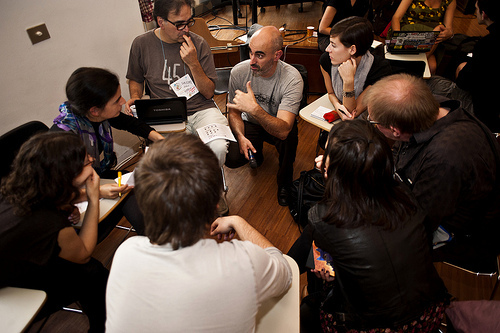 The different actions that can be developed from the ‘escuela de los commons’, like formal and informal education, academic and non-academic research, reciprocal consulting services, a project incubator or dissemination space and transfer of existing experiences, etc, can help to think the school itself as a commons. Like a communal resource that can be economically sustainable, that can satisfy the demand of its community and those of akin communities that join the experience. Several similar initiatives in different geographies and with different local communities are set up with similar objectives. It should be observed that the ‘Escuela de los Commons’ seeks to establish close contact with likeminded initiatives and has done so from the start. In this respect, the aim is to jointly develop a “commons model” for schools of the commons, sharing resources and contributions, and developing reference implementations and replications globally. The project started in 2011. The main activities developed until now are bi-monthy self-formation sessions around different commons such as commons and democracy and public space, commons and the market, natural commons, among others. Other topics of our interest are digital commons, models of commons governance, commons and new social rights, commons and political enterprises, commons and economical enterprises, economical sustainability of the commons, and finally, relationships with social movements and the “mainstream” culture. Each of our self-education sessions is prepared by a presenter and then we have a general debate. The school is nomadic – we intentionally decided to meet each time in a different place connected to a commons experience. Its nomadic character is a way to spread the commmons and network the project with commons experiences in the region. In each session we tried to involve also people from the field and invite other people particularly interested or working in each session topic. Among others, we have met in – Zinccc – a co-working space of the creative sector in Barcelona’s Raval neighbourhood; in a self-managed social centre – Infoespai – in Gracia, which hosts an organic cooperative (Cooperative Infoespai) and provide techno-political tools; in the center for de-growth studies based in Barcelona and connected to the ICTA institute; and, in the Institute of Governmental and Public Policies of the Autonomous University of Barcelona (http://igop.uab.cat) which is synergically connected to the School. Participation to the session also take place though online channels (Skype). Furthermore, we tried to record each session and plan to edit a video on the commons from those recordings. We also have a recently created working group which is designing a curriculum on the Commons for several typologies of study programmes (http://p2pfoundation.net/E2C/Curriculum_Design). Activities could include: introductory workshop; on- and offline debates; (guest) lectures; essays; and, contributions to specific commons. We seek commons-based pedagogies, peer learning and activity-based programmes. Complementing online work from a distance with face-to-face encounters. Peer support and peer assessment can be a strong part, while depending on the sustainability model, there could be a commitment from experienced mentors to accompany participants (apprentices) on their learning path and provide feedback to assignments. To form a true educational commons and allow the use and reuse by others under equal conditions, in this regard, all content shall be under free licenses. In this sense activities can be designed that help construct the commons-based educational programme, where every participant contributes her/his little grain to the larger education commons. 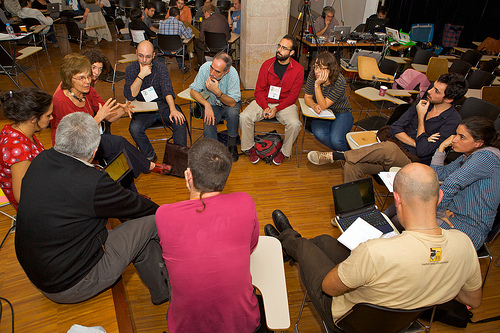 The group also celebrated a workshop on the commons as part of Digital Commons Forum in Barcelona on October 2011, together with Amical Viquipedia (the Catalan association on Wikipedia). Finally, through the School’s mailing list, we keep connected and use it both as a coordination tool and as a forum of exchange and debate on news and inputs. The group is formed by a “remix” of commoners, some coming from digital commons experiences such as Wouter Tebbens (Free Knowledge Institute http://freeknowledge.eu/), Mayo Fuster Morell (Catalan Viquipedia, Digital Commons Forum (www.digital-commons.net) and researcher on the governance of digital commons (www.onlinecreation.info)) and Enric Senabre working on community sourcing and sustainability (http://goteo.org/), natural commons such as Giacomo D’Alice researcher on natural commons and Economics and Technologies for sustainable development at the Institute of Science and enviromental technologies (ICTA), cultural commons such as Ruben Martinez working on public policies, social innovation and culture and commons enterprises) (www.empresasdelprocomun.net and http://leyseca.net/) and Nicolas Barbieri on cultural policies and third sector, additionally, Joan Subirats and Marco Berlinguer develop political analysis linked to (as other members) the Institute of Government and Public Policies (igop.uab.cat), Guillermo Rojo is part of the cooperative movement and in concrete Cooperativa ETCS, and Javier Creus is a creative from ideasforchange.com. Most of us combine involvement in commons experiences with developing research in the area. Around 1/3 of more active participants are from other European and Latino-American countries. Unfortunately, there is a remarkable male predominance in the group, but we are trying to balance it. A part of these more regular participants, we are connected (mainly though the e-list and the self-formation sessions) with a larger network of people and experiences. I especially like the idea that the ‘Escuela de los Commons’ is a roving school interested in celebrating commons spaces and commons activities for learning… for me, breaking out of the dry academic patterns towards dynamic sharing and collective experiences is what commons learning is all about.